What is Beepxtra? Watch the video and find out? Beepxtra is free to join and incredibly viral. The speed and growth of Beepxtra will astound everyone around The World. Clients can go for a haircut into a Beepxtra shop, pay full price but they have cash back discount loaded on their card. They can then go into any other Beepxtra shop or business around the world, in person or online, and use the cash on their account to come off the price of their next purchase. Beepxtra is completely FREE to join for individuals and free to join for shops and businesses. 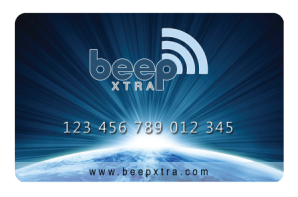 The BeepXtra loyalty cards are free and each new business is allocated beep cards to get them started and they are replenished as necessary. The only cost to a business is a one off integration fee from one of three options that beep provide. This is at a cost of only a few dollars. If the shop or business has a smart phone or in store PC they can have the retail version of our EPOS integrated straight to their business without the need for the tablet terminal. This cost is even less and covers integration to the system. The Beepxtra system is available globally. The viral Beep Xtra invitation techniques are available in many languages and the Beepxtra website is instantly convertible to most spoken languages. Beepxtra merges the two worlds of Online & Offline. Beepxtra recognize that some businesses needs a website more than others. Eg. A local butcher has much less need for a website compared to a mobile phone supplier, hotel or restaurant. Beepxtra gives a global presence to the local butcher and they don’t need a website with this system. Beepxtra places them online for free and ensures clients looking for meat and produce find them. A client from another country could be visiting the butchers town and can use their smart phone to find where is the nearest Beepxtra butcher is. The Beepxtra system not only finds the butcher but it converts to a global mapping system and offers to take the client to the butchers door! So, when we say we bring the customers to your door we can literally do that. Now, and possibly for the first time, competing businesses can recommend each other. A chinese restaurant who gives the Beepxtra card to their client now receives income when the same client visits any other Beepxtra restaurant in the world, even their traditional competitor across the street. Beepxtra has attracted corporate clients with large databases such as football clubs and these clients are now looking for Beepxtra businesses to spend in. A targeted product search facility means that businesses working with Beepxtra will be found by the clients who are looking for exactly what the business offers. Beepxtra advertising is free. All beep ask shops and businesses for, is to give a discount cash back into the system that works for their individual business. In other words a discount they can afford. A huge point is this; businesses giving the Beepxtra card to their clients will now earn an income from their clients spending anywhere in the world where they spend in a Beepxtra store. It is a possibility that some businesses will earn more from the outside activity of their business than internally. Shops and businesses can now reduce the amount of cash flow they allocate to advertising as this is free with Beepxtra. Some of the savings on cash flow can beallocated to the cash back discount system, and good stewardship can increase a business’s bottom line on this one factor alone. Another advantage for the shop keeper or business is that working with Beepxtra is a positive cash flow. This is unlike many forms of advertising where the cost is up front without any guarantee of how much revenue the advertising will bring in. With Beepxtra if there is no sale there is no discount. So the only time discounts are applied is when we prove that Beepxtra works. Eg. A sale is made. Beepxtra uses technology to the full with a more than sensible dose of practical common sense. Take a look around beepxtra review to learn a lot more about this business opportunity.